As one of the world’s largest inland city of mountains and rivers, Chongqing is a city full of surprises and wonderful and charming corners. Since ancient times, its landscape and numerous historical sites have attracted many ancient writers and calligraphers. 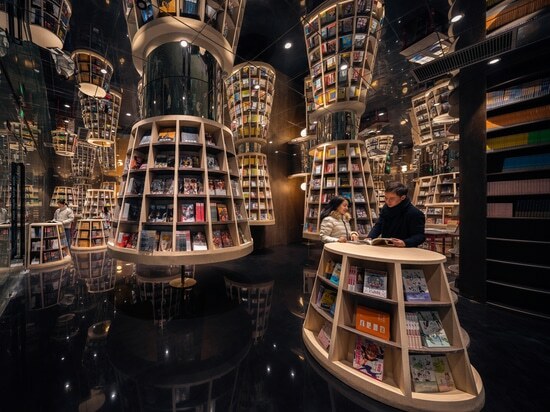 Until today, Chongqing is still a city of attraction to everyone.Located on the 3rd and 4th Floor of Zodi Plaza, Yangjiaping, the Chongqing Zhongshuge greets visitors with a simple glass facade covered with text. Once inside, scattered “lampshade-shaped bookshelves” are found throughout the dark brown lobby. Visitors can feel as if they were in a bright and warm private study when they read in the warm light projected from inside the lampshades. 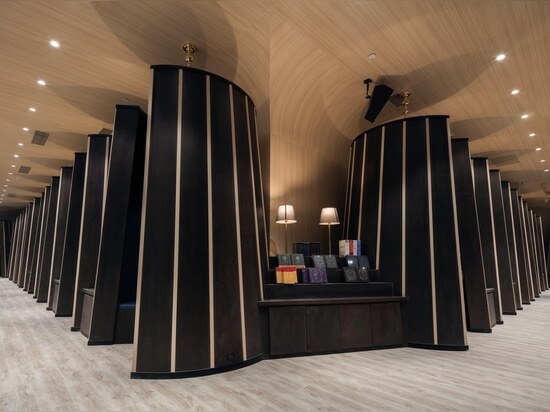 On one corner of the lampshade-shaped lobby is a quiet reading corridor, with bookshelves extending down the hallway. 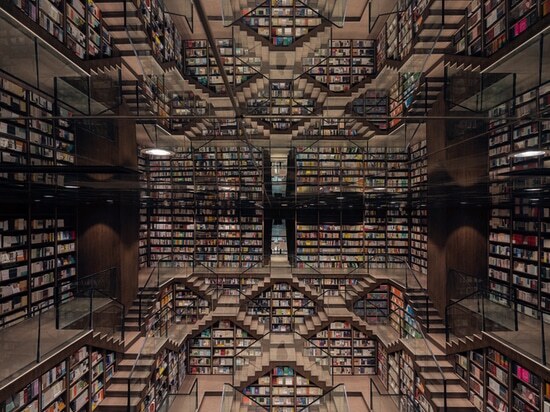 The bookshelves reflect on the ground and form a tunnel of books that beckons visitors to follow it deeper into space and knowledge. 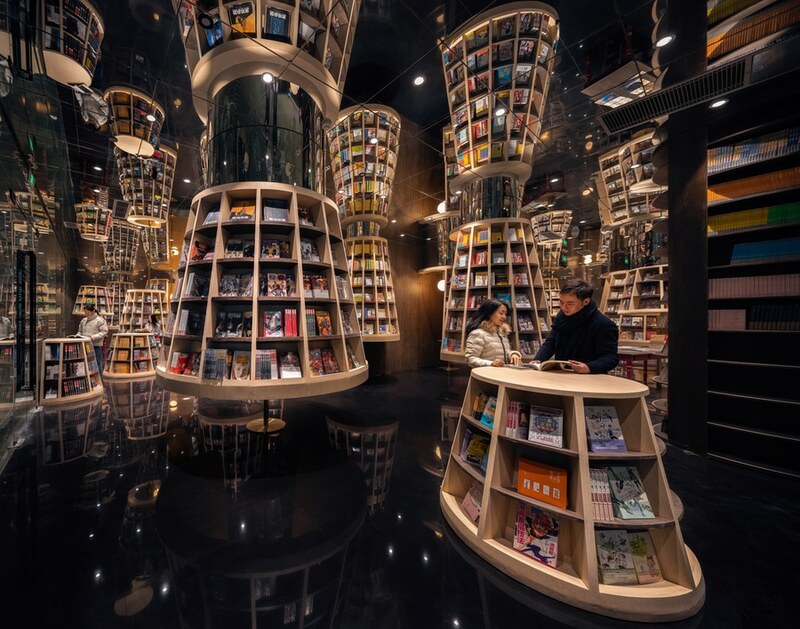 On the other corner of the lobby are the children’s reading room, where the bookshelves are built colorful withdrawn Chongqing’s landscape, buildings, and transportation. 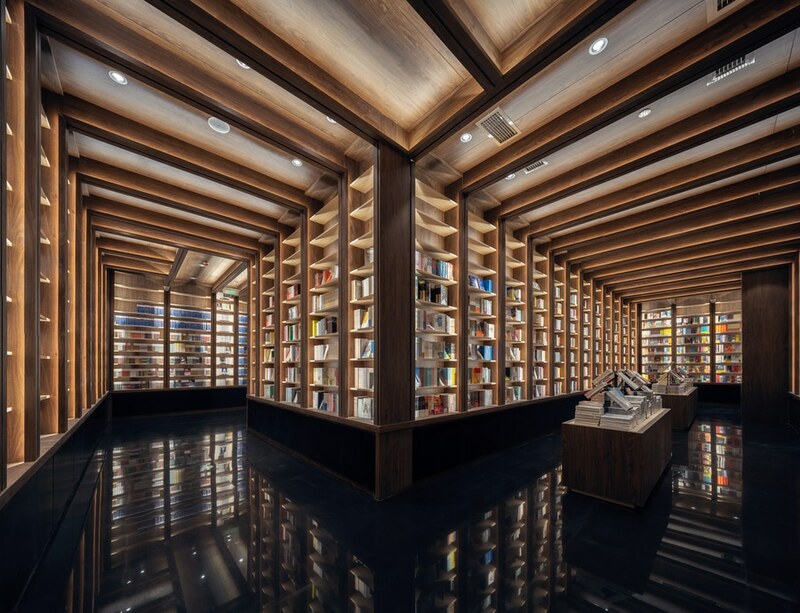 Children may feel like in the charming Chongqing while reading in this room. 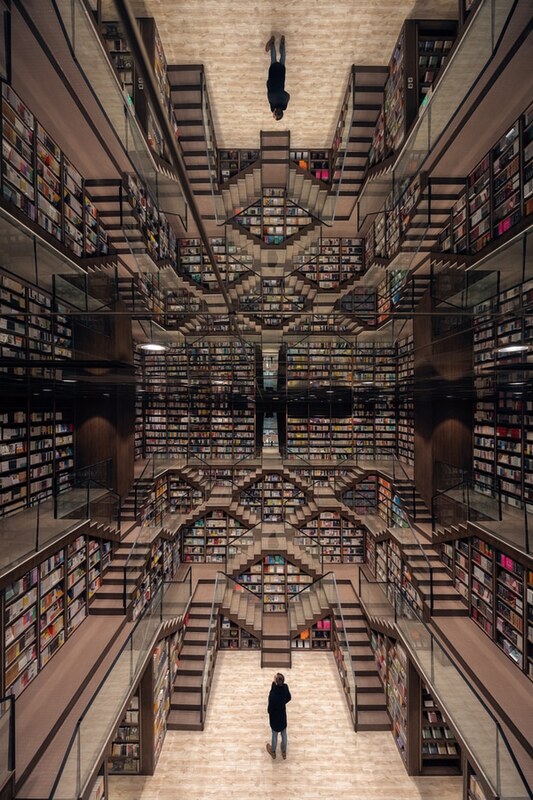 Further down the corridor and the children’s reading room is the main study, a “ladder hall” where the stair double as bookshelves and the mirrored ceiling overhead doubles the size of the already astonishing room. 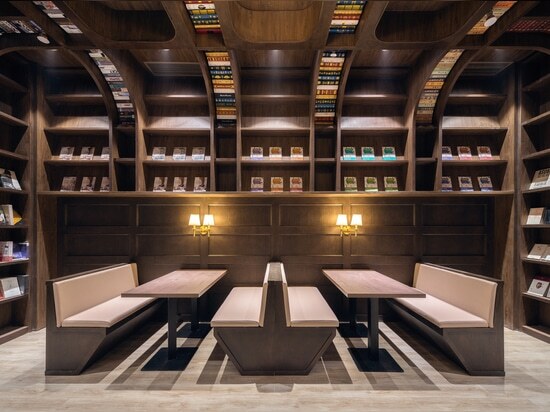 Space allows visitors to rest on the shelved steps and be immersed in books and thoughts. 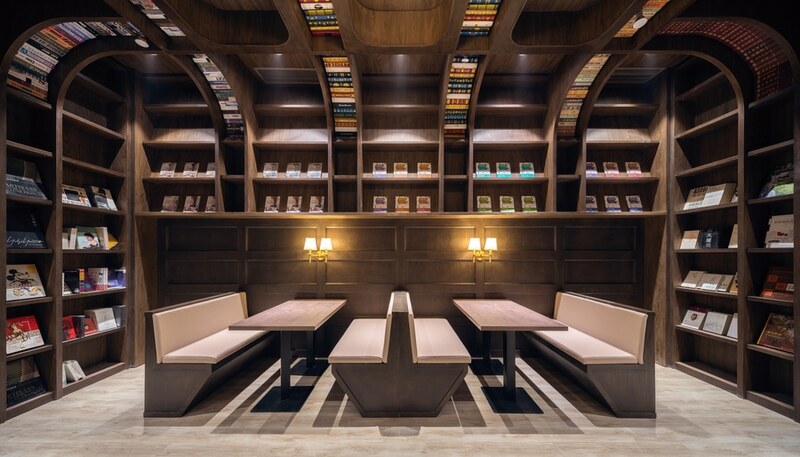 Up to the 4th floor from the “ladder hall” is a leisure area, where visitors can enjoy the aroma of coffee or a taste of good tea and immerse themselves into a tranquil world of different stories by reading. 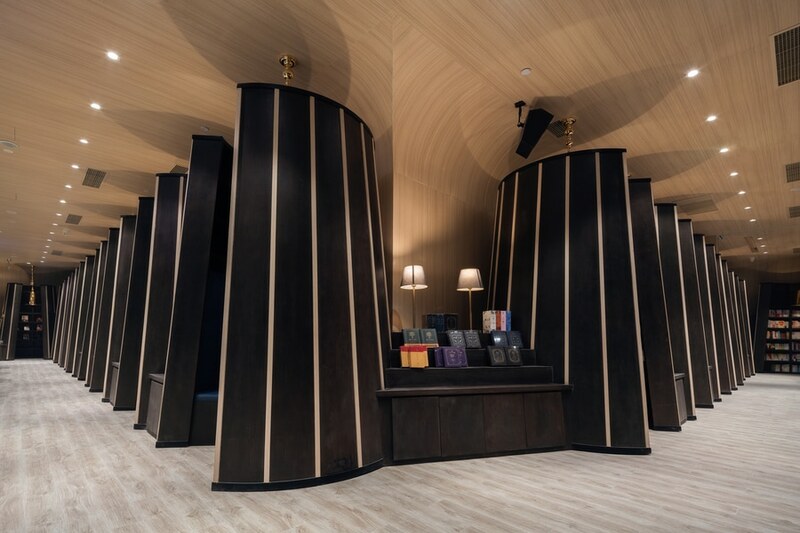 The “lampshade-shaped bookshelves” around create scattered booths at this area, in which visitors may gather with friends to have fun reading and enjoy their leisure time. 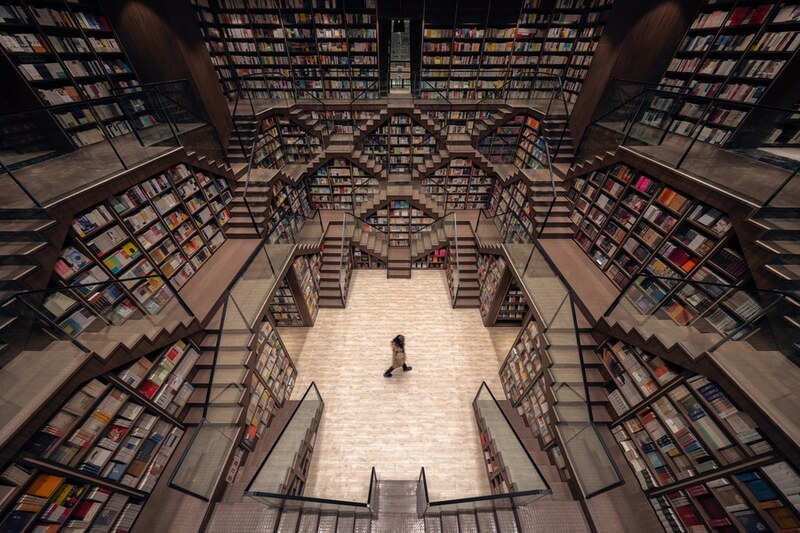 Connected to the leisure area is the extensive reading hall, where works of great minds are listed and visitors are able to broaden their eyes and enrich their spiritual world. 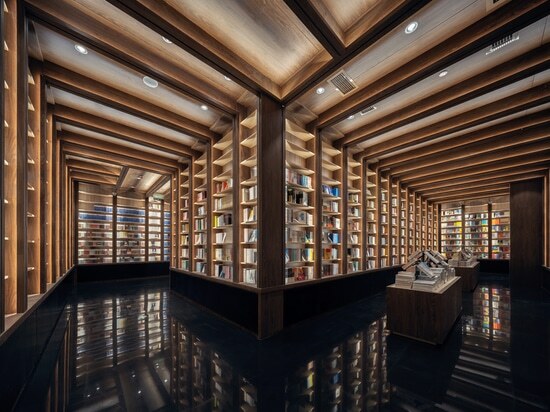 Zhongshuge Bookstore is a good place to read books, understand one’s life and meet others. 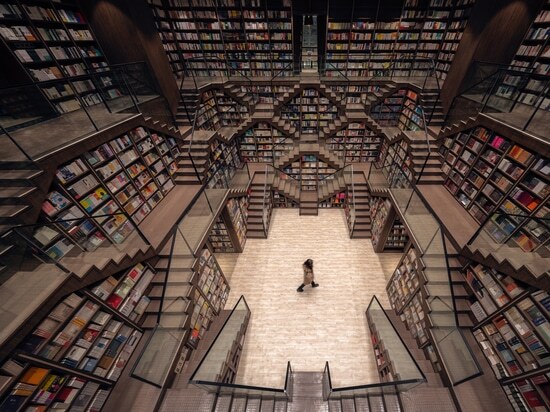 It is hoped that visitors to it can not only read good and new books but also meet friends of the same interests.